This powerful doco shows us the strength and majesty of this magnificent Great Cat. 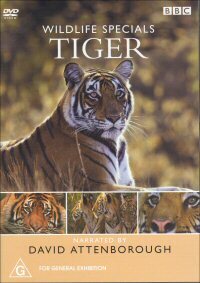 Narrated by David Attenborough we follow the journey of Lakshmi and how these great cats make their daily lives about in the wild. A unique thing about this feature is that due to the fact that the animals have been protected by humans for so long, there is a sense of trust and as a result, we the viewer are privileged to get up close and personal with these beautiful creatures. There are all facets of life for these animals covered and something that I found most interesting was the lives of those men who were there to protect the tigers from other human predators. The outlook from those people is very insightful and you come to get a real respect for what they are trying to achieve out there as a part of Project Tiger which has been going for over 25 years. The feature only runs for about 50 minutes and visually is stunning. Something to note is that the aspect ration on the slick is not correct and the true one is widescreen which is lovely. The footage is taken through a variety of weather conditions which make for some truly lovely viewing. Audio is taken care of with a wonderful score and a 2.0 Dolby Mix. Recommended for anyone interested in a indepth look at this great cat. Good stuff.